A perspective on global wealth requires a review of the context in which wealth is generated. That starts with an enumeration of the population and its growth. The purpose of this blog is to examine the number of world adults and then proceed with an analysis of the components of wealth. Special emphasis will be placed on the inequality in wealth on an international basis. Wealth is embedded in the population that supports it. From a historical standpoint the current growth of mankind can be traced to the culmination of the industrial revolution after WWII when advances in health and in the availability of food on a global scale made available on the basis of US leadership to promote growth in international trade. 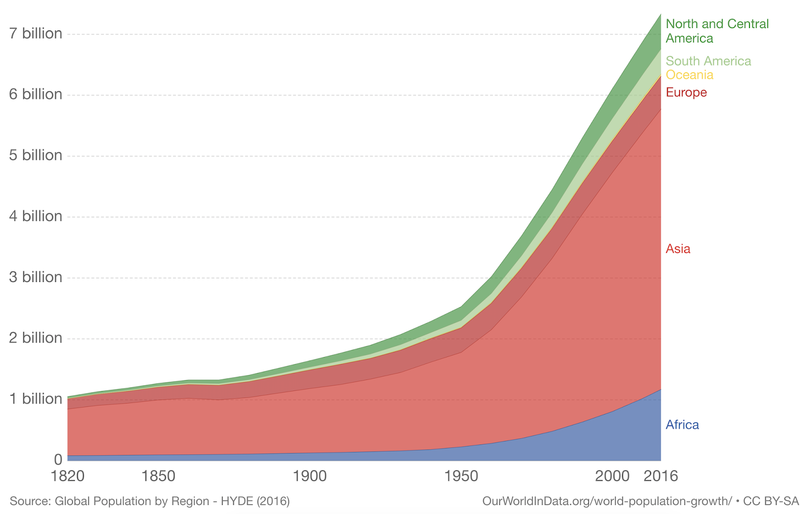 The remarkable shift in population trends reflect the political stabilization in China and India while the populations in Europe and America kept decreasing in relative importance on a global scale. 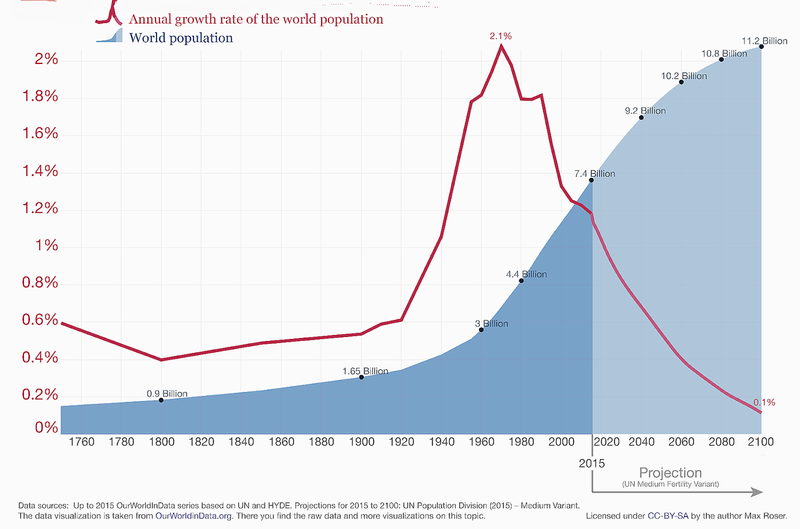 The currently projected reductions in the population growth rates until 2100 will slow down global population from the current 7.4 billion to expected 11.2 billion. With increasing limitations on natural resources the expectations about the growth in wealth will have be based on a civilization that produces a qualitative different economy than is currently the case. 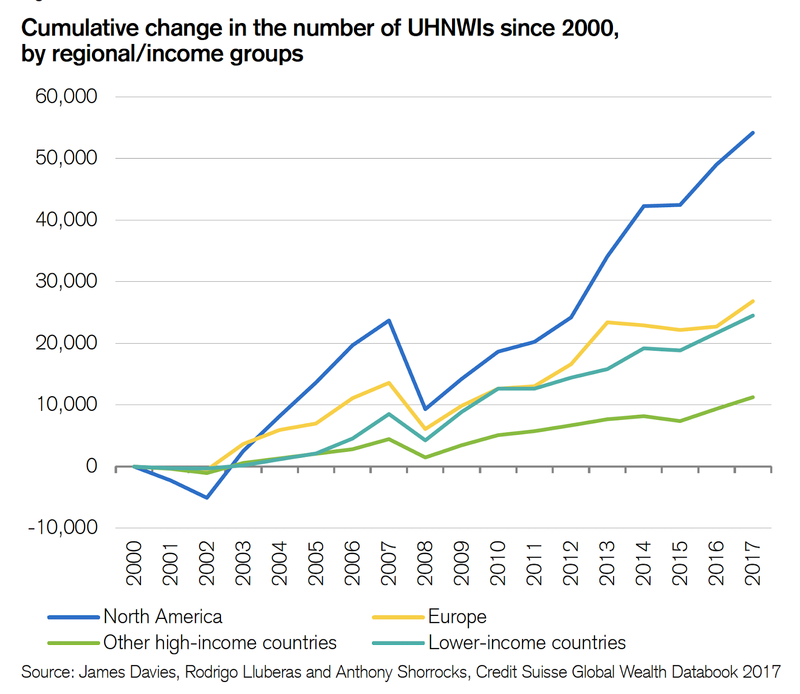 At present there are enormous inequities in wealth between the large concentration of assets mostly, in the US and in Europe, and the prevailing poverty in the remaining world. This blog will study of the economic structure that supports the existing wealth. Such understanding will suggest the directions for a different organization of society that may evolve in the forthcoming century. 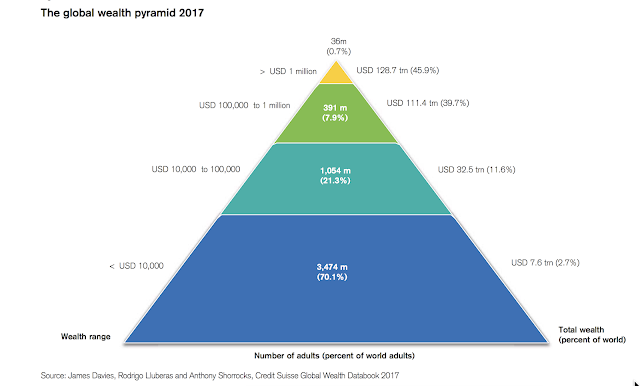 The distribution of data about wealth shows that 45.9% of total wealth held over $1 million is held by 0.7% if the total global adult population. 39.7% of total wealth is held by 7.9% of prosperous adults. It is 3.5 billion of adults, or 70.1% of the global population, that can be classified as "poor", or living at a subsistence level. 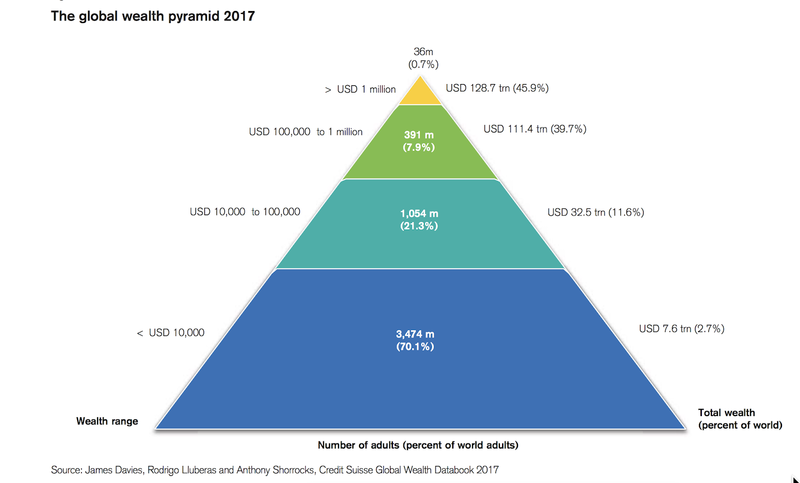 This shows that 8.6% of the global population are either rich or wealthy by owning 85.7% of assets. This leaves the remaining 4.6 billion people either struggling for an improved existence or remaining at subsistence levels. As we enter into a new era that could benefit from the technologies of production as well as the science of well-being, the prospect of greater global wealth for everyone are for all practical purposes unlimited. However, as seen from the present times, the realization of all of the potential gains still remain in a distant future. 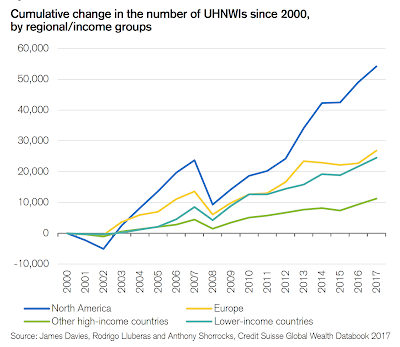 Only North America and Europe show high incomes (over $100,000), or possess affluence with incomes over $ million (6.1% for North America and 1.8% for Europe). This overstates wealth if that considers only adults. The population of poor regions show many (up to 30% of total) young people. If youth is included, Africa, India and Latin America are indeed impoverished. The significant ratio of high wealth as compared with insufficient incomes are the ratios of Over $1 million to Under $10,000 adults. The least disparity in wealth can be found in Australia (1.19) and the greatest in Germany (0.10). Such comparisons are similar to the well known GINI coefficient. The extreme concentration of the super-rich overwhelms all other countries. 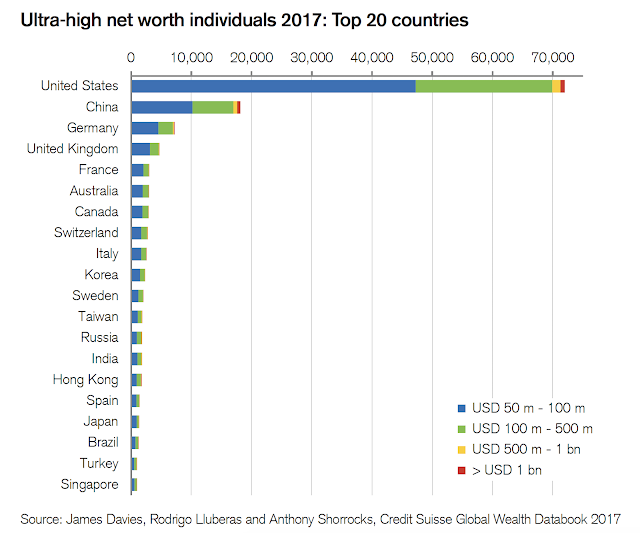 Although the popular press often features stories about "billionaires", in fact all other countries' concentration of wealth is not comparable and certainly not in correlation with the relative levels of GDP. 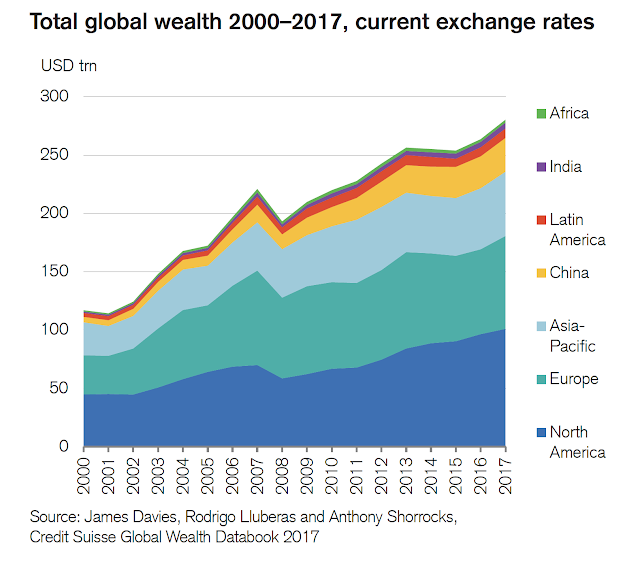 The dominant shares of wealth have remained unchanged except for minimal gains for the Asia-Pacific and China regions. The global inequality in wealth has maintained past unbalances, without an indication that a disruptive trend in favor of the poor would appear. From a global point of view the relationship between the rich and the poor for 70% of mankind has remained the same. 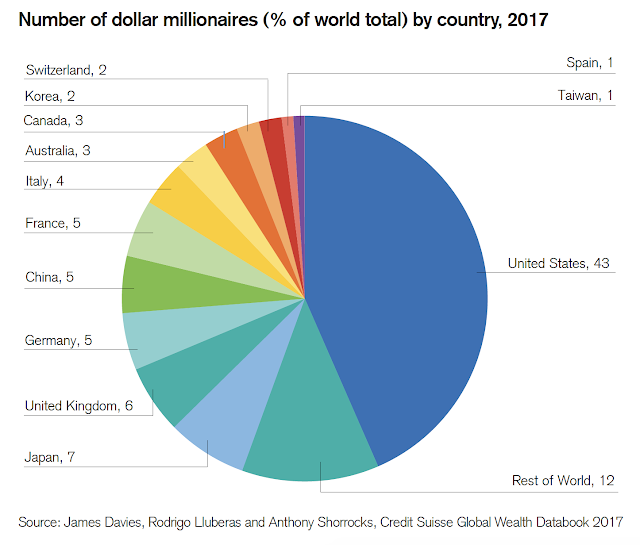 Only Japan, China, Korea and Taiwan have 15% of millionaires from other than Europe and North America. This confirms that a concentration of wealth through millionaires continues to prevail. 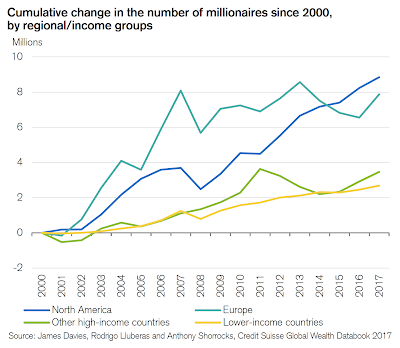 The above trend line confirms that US individuals at the top of the wealth scale were gaining as compared with all others. The progress of mankind has been admirable but insufficient in meeting the demands of its rapidly growing population. Most of the benefits of wealth creation have so far been concentrated in North America and Europe. How will greater wealth be available for the rest of the world? Who will provide the technological, political and economic leadership that will overcome the present disparities in the distribution of wealth? The answers to these questions will be written as a sequel to the preceding 8,000 years of human struggles for progress and advancement of our global civilization. So far we are the only occurrence of life in the universe. We must cherish and nurture every potential source that will support an ever growing prosperity. 70.1% of the World adults do not earn a sufficient income. 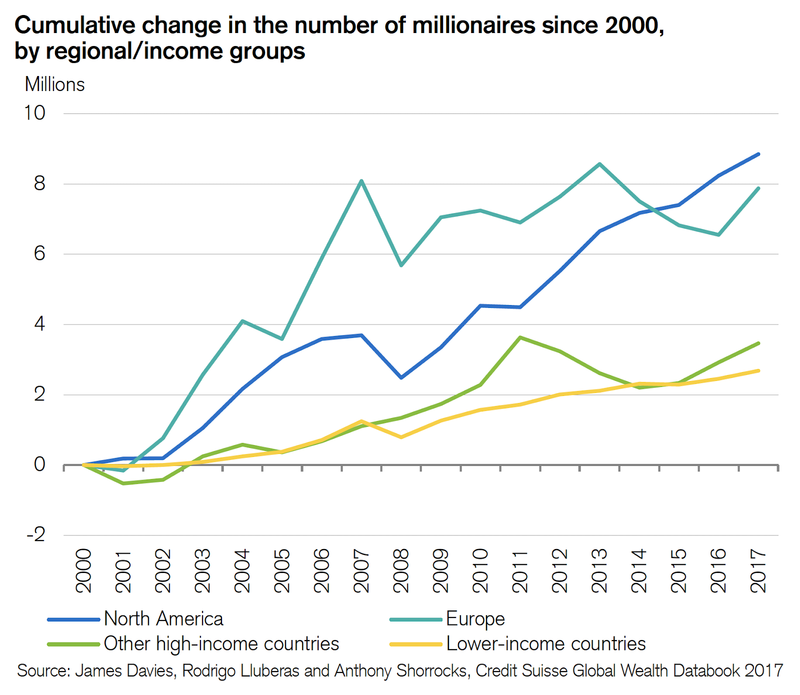 Only North America and Europe show high incomes (over $100,000), or possess affluence with incomes over $ million (6.1% for North America and 1.8% for Europe). This overstates wealth if that considers only adults. The population of poor regions show many (up to 22% of total) young people. If youth is included, Africa, India and Latin America are indeed impoverished.